The Asian hornet (Vespa velutina) is an invasive predatory pest that originates from Asia. There are a dozen known sub-species of the Asian hornet. 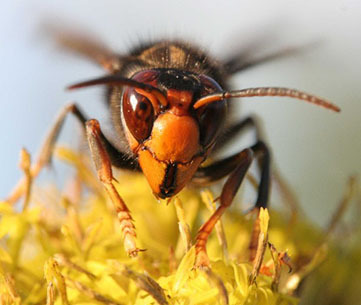 While typically all hornets are predators of insect species, the Asian hornet has been seen as a significant problem for beekeepers due to its aggressive and effective predation of the European honey bees and wild bee populations. Asian hornets have a direct impact on honey bee colonies by killing honey bees and honey bee brood to feed their own brood larvae. Asian hornets also have an indirect impact on hive health by causing honey bees to spend time and energy mounting a defence to the constant threat of attack and thereby inhibit foraging activities. This in turn decreases the productivity of the honey bee colony, which not only leads to reduced honey and pollen reserves, but also puts at risk the developing brood and the ability of the hive to provide effective pollination services. The life cycle of the Asian hornet is annual. Fertile female Asian hornets are stimulated to begin laying by warmer temperatures in spring. The fertile female will begin to build a small roughly shaped nest in which to lay her new brood. A single queen will only produce one nest in her year life cycle. Like other social insect species the Asian hornet workers produced by the queen are sterile and live between 30–55 days depending on temperature. 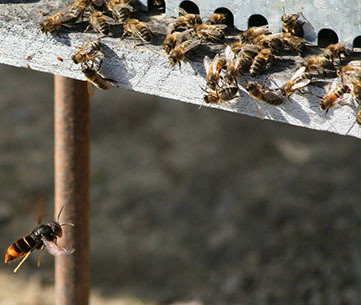 The workers forage for food to feed the queen and the developing brood, as well as continue to construct and expand the nest. 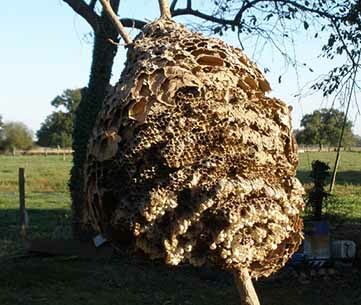 Depending on the local conditions, a hornet nest around 90cm in height can house between 500–1500 hornets. Toward the end of summer and into autumn, reproducing females and males emerge from the nest to mate. The Asian hornet workers remaining in the nest will die in the cooler temperatures and the nest will be abandoned. 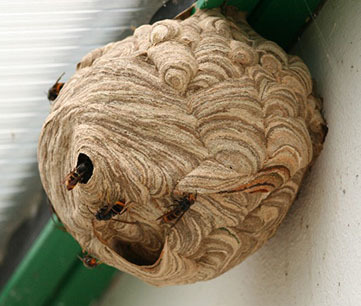 Asian hornets do not reuse the abandoned nest. The descendent fertilised female Asian hornets will over winter in insulated and sheltered cavities (such as under bark or in the small hollows of trees), alone or in small groups, before emerging to establish a new nest in the spring. The Asian hornet has a very distinctive appearance. Queen Asian hornets are between 30–35mm in length and workers/foragers are about 25mm in length. The body of the Asian hornet is a velvet black/dark brown with each abdominal segment bordered with a fine yellow band. Only the fourth abdominal segment is entirely yellow-orange in colour. The legs are distinctively brown with yellow tips and the head is black with orange-yellow face. The nest of the Asian hornet is also very distinctive in appearance, though are typically hidden from clear view. They can become large nests, built high around the branches of trees or man-made structures. Some nests have also been observed very close to the ground as well. In France and their subsequent spread through Europe, they have been observed to prefer oaks, poplars and acacia trees (which are abundant throughout Australia) but avoid conifers. However, they can also be found in garages, sheds, under decking or less frequently in holes in walls or in the ground. The nest is spherical in shape and at the later stages of construction (toward the end of summer and into autumn) they can measure between 60–90cm in height and 40–70cm in diameter. The nest has an exterior shell made of 5–6 layers of paper mache-like material, which is beige or brown in colour. Each layer is about 45mm thick and the layers are separated by a 5–10mm gap. The nest has a single entrance hole about 15mm in diameter which is protected by an awning. Inside the nest there are usually 6–7 ‘cell cakes’ which contain the brood nest. Each cell cake is separated by a 10–12mm space and sits about 15mm in from the exterior shell layers that surround them. The cells are 8.5mm in diameter and about 26–29mm deep. 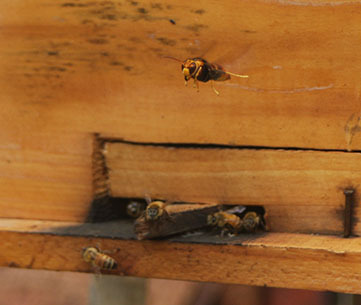 There are a number of ways to detect the presence of Asian hornets around apiaries. Foraging Asian hornets will typically appear during the day, ceasing all activity at dusk, and are most active from spring until autumn (the exact length of time is primarily dependent on the climate). They can be observed hovering or ‘hawking’ outside honey bee colonies killing foraging bees that are returning to the hive with a load of pollen or nectar, or guard bees that attempt to defend the hive from attack. The hornets force the bees to drop to the ground before paralysing them. The foraging Asian hornet will then proceed to decapitate the bee, remove its legs and wings and convert the body into a squashed ball for transport. There are also reports that predation extends to entering the honey bee colony and stealing honey bee brood. When this occurs, it appears that the Asian hornet attacks all of the honey bee guards one by one before robbing the brood nest. 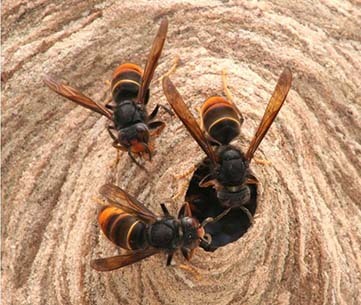 A foraging Asian hornet will only consume a portion of the prey it captures; the rest is taken back to the nest to feed developing Asian hornet larvae. In its native regions of Asia, the Asian hornet has been reported to destroy up to 30 per cent of a colony of Asian honey bees. Reports from France suggest that in some regions where there are high densities of Asian hornet, such as the south of France where there is a long and warm summer season, complete hive losses have occurred. Beekeepers in France have observed that European honey bee hives have been completely lost, and that the Asian hornet commonly attacks hives that are generally very weak, have low numbers of foragers or in some cases are queen less. In addition to attacks on honey bee populations the Asian hornet could also disrupt native biodiversity by predating on other native social wasp and insect species as well as crickets, butterflies, flies, caterpillars and spiders. They have also been known to consume ripe fruit and flowers toward the end of summer. They are not generally aggressive towards people, unless their nest is disturbed; in these circumstances they can administer a painful sting, like other hornet and wasp species. 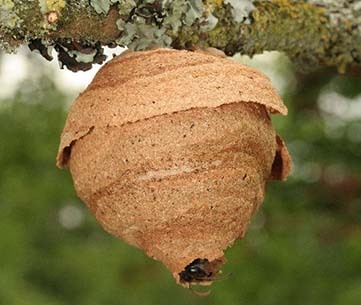 Asian hornet nests can be found high in trees, though typically they will be hidden from view until autumn when the nests are at their largest and some tree species lose their leaves. In trees the nests are large, brown, spherical balls built around branches. However, the nests can also be found in garages, sheds, under decking or in holes, or less frequently in holes in walls or in the ground. The nests will typically be found close to bee hives. During winter any small well-insulated areas (natural or man-made) can be inspected for the presence of hibernating fertile queens. The use of traps placed around hives can assist with detection of Asian hornets around apiaries and also help to protect the hives from constant attack. Traps are available commercially but it is also possible to make home-made traps. 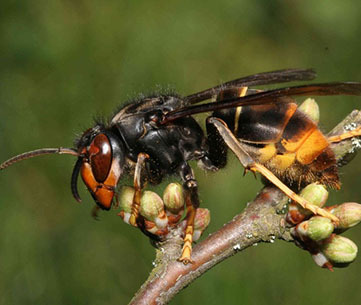 Asian hornets are very strong flyers and therefore highly mobile; in France the Asian hornet has spread at a rate of approximately 100km per year. The Asian hornet has been accidentally spread internationally from Asia in goods shipments where nests or fertile queens can be found in freight containers, untreated timber, in the soil of imported pot plants, cut flowers or fruit. It is also possible that the Asian hornet could be wind-blown between closely neighbouring countries. The Asian hornet is native to Asia and occurs from Afghanistan across India, Pakistan and into eastern China, as well as in the Indonesian archipelago. The Asian hornet subspecies Vespa velutina nigrithorax was accidentally introduced to south-western France, on a shipment of pottery from China in 2005. Since that time it has become widely established in south-west France, as well as some regions of Spain and Belgium. In 2003, the Asian hornet arrived in South Korea and quickly became established, spreading at a rate of around 20km per year. 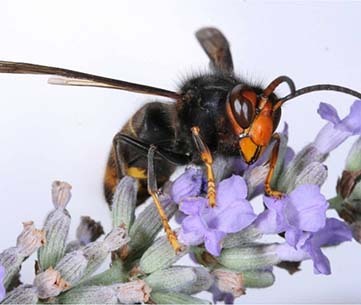 Since the accidental introduction of this pest, the Asian hornet has become the most abundant hornet species in southern Korea, displacing many native Vespa species which have a similar nesting biology. The rapid spread of the Asian hornet throughout these countries demonstrates that this is an incredibly aggressive and invasive pest, and that it will become a major problem as more people and beekeepers come in contact with this pest. If you suspect any of these species, or notice any hornets or wasps attacking your honey bee colonies contact your local department of agriculture or call the the Exotic Plant Pest Hotline on 1800 084 881. This pest is currently not present in Australia and there are strict quarantine requirements in place to protect the Australian honey bee industry. If you notice suspicious nests, mark the location of the nest and if possible, take a photo. Do not attempt remove the nest. If you notice hornets or wasps attacking a colony of honey bees, report it immediately. Report any possible sightings of the Asian hornet, or other suspect exotic hornet or wasp species to your local department of agriculture, or call the Exotic Plant Pest Hotline on 1800 084 881. These videos provide information about the life cycle, identification and the impact of Asian hornet on honey bees and beekeepers. Please be aware that these videos were produced overseas, and treatment recommendations or conditions experienced may differ to those in Australia.